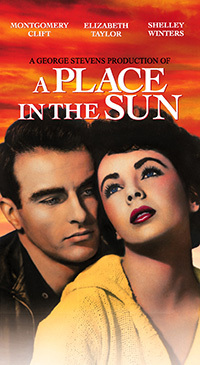 Montgomery Clift and Elizabeth Taylor star in the award-winning film, “A Place in the Sun”, the next film in Ogunquit Performing Arts’ Classic Film Series, Sunday, April 8, 2018, 2 pm, at the Dunaway Center, 23 School Street, Ogunquit. Free Admission, parking and popcorn. Ogunquit Performing Arts’ next-to-last film in their 2017-2018 Classic Film Series is George Stevens’ award-winning film, “A Place in the Sun”, starring Montgomery Clift, Elizabeth Taylor, and Shelley Winters. The film will be screened on Sunday, April 8, 2018 at 2 pm on a wall-sized screen at the Dunaway Center, 23 School Street, Ogunquit. Admission, parking and popcorn are free. This stunning film was a critical and commercial success, winning six Academy Awards, (including Best Director for George Stevens), and the first-ever Golden Globe Award for Best Motion Picture – Drama. Stevens directed the film from a screenplay by Harry Brown and Michael Wilson. Its supporting actors include Anne Revere and Raymond Burr. The film is based on Theodore Dreiser’s 1925 novel, An American Tragedy, the story of the real-life murder of a poor, pregnant factory girl by her social-climbing fiance. It had been filmed by Josef Von Sternberg in 1931, starring Sylvia Sidney, Phillips Holmes and Frances Dee. George Stevens’ 1951 version, “A Place in the Sun” focused more on the developing romance between the man and the rich girl, and changed the poor girl’s death to an accident, but maintained the psychological motivations and class distinctions of the novel. Montgomery Clift was already one of the most important young actors in films, and had been nominated for an Academy Award for his first film, The Search (1948). Intense and neurotic, Clift was ideal for the part of George, and worked extremely hard on his character. In preparation for his character’s scenes in jail, Clift spent a night in a real state prison. He determined not to play the walk to the electric chair with high drama, but instead walked to his death with a naturalistic, grim facial expression. George Stevens cast Elizabeth Taylor, not yet 18 and incredibly beautiful, as Angela, the most demanding role of her career thus far. Stevens asked much of her, shooting take after take, but Taylor lived up to the challenge. Taylor was also initially intimidated by the intense scenes she had to play with Montgomery Clift. “Monty was the New York stage actor and I felt very much the inadequate teenage Hollywood sort of puppet, – that had just worn pretty clothes and hadn’t really acted except with horses and dogs.” Clift put her at ease, and the two began a life-long friendship. Shelley Winters originally broke into Hollywood films as a blonde bombshell type, but quickly tired of the role’s limitations. She had previously achieved leading roles in The Great Gatsby and Winchester 73, and was determined to play against type in “A Place in the Sun.” She claimed to have washed off her makeup and worn dowdy clothes to audition for the role of Alice Tripp, the factory girl in the film. Her performance brought Winters her first acclaim, earning her a nomination for the Academy Award for Best Actress. Don’t miss this acclaimed film, “A Place in the Sun”, on Sunday, April 8, 2018, at 2 pm at the Dunaway Center, 23 School Street in Ogunquit. The film is shown on a full wall-size screen, admission, parking, and popcorn are free!